The Bolingbrook Chick-fil-A kicked out two Christian aliens who were trying support the besieged fast food chain. X and his brother, Senchu X, went to the Bolingbrook Chick-fil-A to participate in Chick-fil-A Appreciation Day. Two males wore bright pink clothing, and purple triangles necklaces. Davud then accused the manager of being a human fig. The manager threaten to call the police, and two aliens left. The two aliens, and sources within the Department of Interstellar Affairs, say Mayor Roger Claar called the restaurant, and straightened things out. The brothers were then allow to order food. The two left without further incident. The two say that they hold no ill will towards Chick-fil-A. “Jesus forces me to forgive them.” Said Senchu. The Chick-fil-A culture and service tradition in our Restaurants is to treat every person with honor, dignity and respect –regardless of their belief, race, creed, sexual orientation or gender. We will continue this tradition in the over 1,600 Restaurants run by independent Owner/Operators. 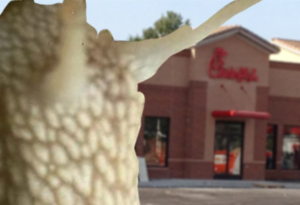 An Illinois Chick-fil-A employee, who wished to remain anonymous, doubted the alien's story and existence, but said he fully supported his employer. Nation of Islam: Stop the murders or aliens will attack!